Regular readers and especially those with iPads may remember that we recently gave details about the iPad Smart Case, a new Apple accessory giving protection to both the front and back of the iPad. Our initial thoughts on this were positive and we now have news of a closer look to give you an idea of whether it’s worth your money. If you want to read more on the details then check out our previous article here. The new Smart Case is priced at $49/Â£39 and Apple has obviously listened to criticisms of its Smart Cover for iPad which didn’t offer protection to the back of the case. 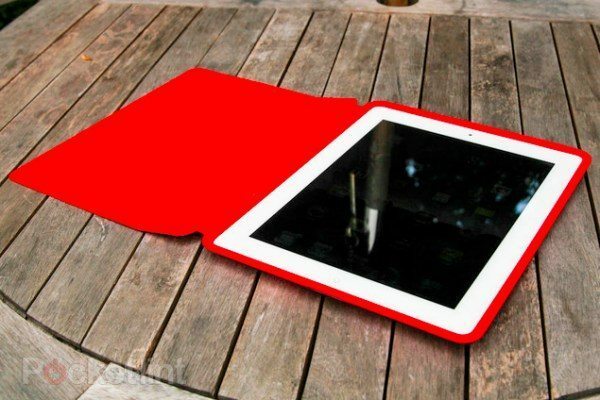 As a brief reminder we’ll tell you that it comes in 6 color options and is suitable for use with the iPad 2 or new iPad (3rd gen). The team over at Pocket-Lint managed to get a hands-on with the new Smart Case and in case you’re wondering about the end of our title, the review looks at the red version, which is described as “very red.” It certainly is, as the many photographs show and we’ll give you a couple of those here, courtesy of Pocket-Lint. Offering many of the features of the Smart Cover, the Smart Case importantly gives more all around protection and to us the extra difference $10 beween the Cover and the Case seems reasonable. In its hands-on look Pocket-Lint noted that the Smart Case offered grip on various surfaces and also pointed out its soft touch. The fit of the Smart Case was suitably snug although easy enough to get on and off due to the polyurethane having a reasonable amount of stretch. Good to hear then that your iPad is very unlikely to slip out of the case. The design of the case has holes for various switches and buttons with enough room to use the mute or lock switch while the volume and power buttons are covered but replaced with soft buttons. As you would expect the Apple logo is shown on the reverse but there are no other markings on the Smart Case. It also features the same magnet system that made the Smart Cover so popular and can be folded to use as a stand for your iPad. However it is noted that the Smart Cover when folded for keyboard use gave more rigidity because of its metal bar whereas the Smart Case when folded into that position, is not quite as firm a support. Ultimately the verdict of the closer look at the Smart Case is that “you won’t be disappointed” although cheaper alternatives will no doubt be available. Our feelings on this are that if you’ve invested in an iPad then the amount extra for the Smart Case seems to us a worthwhile cost. 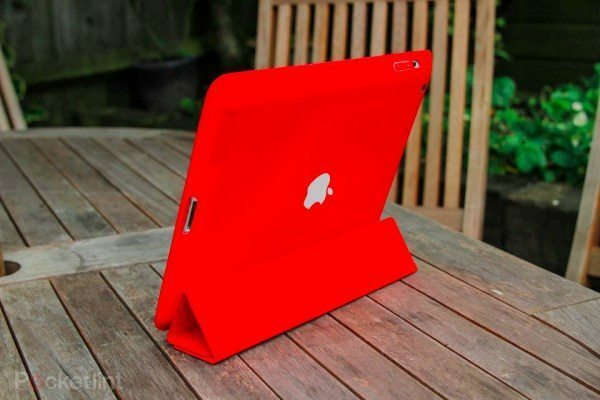 If you want to see more on the Apple iPad Smart Case or to order one then head to this Apple page. What are your thoughts on the new Smart Case? Have you already ordered and received one? If so would you recommend it to our readers? Let us know with your comments. I would totally recommend it. Forget the red. I have the dark grey and it’s delightful as a contrast to the white bezel. The case is sleek and minimalist which adds very little weight and bulk. It’s soft texture is comfortable to hold. Like the article mentioned, it’s easy to insert the iPad and there is no chance of damaging it just by inserting it which is what happened to me , it was scratched by the rough edges of a hard plastic shell case. The only point is that it is snug at the corners but somewhat looser along the edges, which may be interpreted as a poor fit. But I think it is designed as such in purpose to make it easier to insert and remove. I really like it and will get a scone one in light grey. I not sure how I feel about mine, I previously had the smart cover with the Belkin Snap shield and loved it, I thought this would be the ultimate replacement, the case feels way to big for my iPad 3 I couldn’t imagine someone with a 2 using my case,when attempting to use the buttons on the side the case will flex in substantially depending on which side of the case the iPad is resting on, also when holding it it feels flimsy along the sides because of the flex.I just wish it would fit the iPad a lot more snug, I would be happy then, but at the same time I feel that mine is abnormally big so I’m not sure if I should take it back. mmmm I agree with Nick. The case almost seems too big for the ipad. When I held it with one hand, the side of the case almost “snapped off” as it had a lot of flex. If the whole thing were just a tad “tighter” it would be perfect. As a quick fix though I have stuffed some paper down the left side and the bottom of the ipad to make it fit better.. now it feels more solid! Happy days are here again! i agree with Nick S and Ant. This new case is too big. Only by a couple ofÂ millimetres, but thats enough to make it move and the lock button on the side not to line up. Also it feels cheap and plasticey and the edges are not smooth, so holding it feels uncomfortable. I’d like a refund but had it engraved, so not sure if i can. Very disapointed. love the Red though. The colour is the only good bit. Love it! Fits my 3 perfectly. Love the red contrasted with the white. Engraving on back is nice and makes it personal. Love the feel and the overall design. Great gift!